The Spruce platform has many advanced tools to help you manage your patients and practice, but we think that one of the most innovative and effective is our unique telemedicine implementation that we call “Spruce Visits.” Maybe you’ve tried telemedicine products before and found them unappealing, or maybe you don’t think telemedicine is a fit for your particular practice, but give us a few minutes to convince you otherwise because the right type of telemedicine can vastly improve your life as a doctor or other care provider. What is a Spruce Visit? Fundamentally, there are two basic types of telemedicine: synchronous (also called “live interactive”) and asynchronous (historically called “store and forward”). Spruce supports both of these, and you can easily start secure video calls with your patients any time you want to. That’s not where we think the telemedicine magic is, though; we get most excited instead about asynchronous telemedicine, because we’ve found it to yield outsized results in physician efficiency, patient satisfaction, and clinical outcomes. 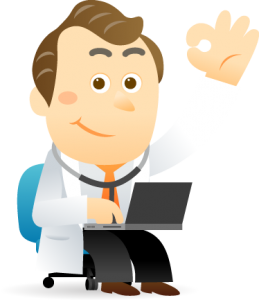 In a typical asynchronous telemedicine encounter, a patient submits a clinical history along with physical exam data (pictures, videos, etc. ), and a remote physician then reviews the case at their convenience and responds, whether to request more information, start a management plan, or pursue some other course. This model has been best developed and studied within dermatology, where many patient presentations are a good fit for a lightweight history and a primarily visual diagnosis. However, there’s no reason that an in-depth history and significant physical exam can’t be collected in an asynchronous manner, and that’s what we’ve been excitedly exploring at Spruce. Now, you probably read that and immediately thought, “Yeah, maybe, but I don’t want to type out a thousand questions to my patient and wait for a response to each one.” Agreed! Asynchronous telemedicine using nothing but secure texting would definitely be slow and painful. That’s why we’ve spent time developing Spruce Visits to accelerate the basics of the interview and exam for you, letting you save your time instead for things that are truly unique to your patient. If you think of the various common types of patients that you see, you can probably imagine a basic interview script for most of them. In every young woman with dysuria, you’ll probably want to know if she has had fevers, back pain, vomiting, vaginal discharge, and a number of other things. But what if you had an intelligent, physician-designed question set that you could send to every such patient that would ask all of these things without you having to type them again and again, repeat them verbally, or wait for each individual response? This, in essence, is the foundation of a Spruce Visit. Add to it the capability for high-resolution photography and directed video snippets, and you produce a compelling set of data from which to start your medical decision-making. We’ve spent hundreds of hours carefully building custom question sets for myriad common chief complaints, and we’ve made sure to use adaptive branching logic so that certain answers prompt important follow-up questions when necessary, just like you would do when practicing in person. 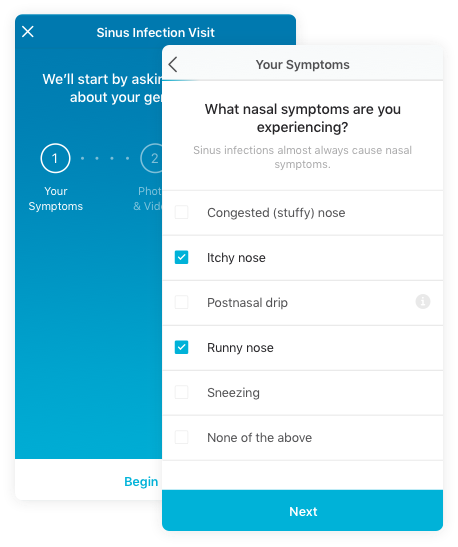 The result is the powerful engine of Spruce Visits, a clinical tool far beyond any simplistic questionnaire or typical online “symptom-checker” form. We’re proud of the evidence-based and physician-led system that we use to develop each individual Spruce Visit, and we’ll be covering that process in detail in a future post. Do Spruce Visits replace the doctor? Absolutely not. Spruce Visits are honed to collect an excellent foundational history and physical exam, but they don’t do any clinical decision-making on their own. A skilled physician is still vital to interpreting the data in a Spruce Visit, and we can’t imagine changing this. Think of Spruce Visits as another tool in your clinical arsenal, designed to extend your abilities and maximize your efficiency, not to replace any of your core doctor-level activities. We’ve also designed the Spruce platform to let you securely ask follow-up questions and engage the rest of your care team members (e.g., nurses, MAs, etc. ), so true care delivery on Spruce is intended to be a holistic experience, with Spruce Visits making up just one piece of the puzzle. Why are Spruce Visits better? There’s a tenden cy to think that video chat with a doctor is the future of telemedicine, but for most patients, we couldn’t disagree more. With an ongoing physician shortage and rising demand, your time as a doctor is likely your most valuable asset, and telemedicine that relies on synchronous video interaction doesn’t save you any time. You don’t have to commute to a clinic, true, but other than that, you’re taking the same history that you otherwise would in person, with all the repetitiveness and inefficiencies inherent to that process. In fact, live video telemedicine might actually cost you time, if you reasonably decide to take a more thorough history than normal because your physical exam is limited compared to in-person visits. With Spruce Visits, on the other hand, your patient can take as long as they need to fully complete their history without slowing you down at all. If need be, you can always switch over to a video visit, but we bet you’ll find this unnecessary in most cases. Spruce Visits also provide an enormous benefit to medical thoroughness and documentation. A Spruce Visit question set will never forget to ask about tetanus vaccination status, breastfeeding, allergies, or many other complaint-specific factors that we all sometimes overlook when interviewing patients in person. Every patient, every time, will get a basic history that you can count on. Furthermore, a patient’s answers will be recorded in their chart just as they provided them, so you save huge amounts of time in not having to: 1) remember to ask a specific question, 2) remember the patient’s answer, or 3) write the answer down later in your note. The very nature of Spruce Visits creates a secure medical record that both protects you medicolegally and saves you from the duplicative work that is otherwise inevitable with in-person encounters and video-chat telemedicine. You’re also not the only one who will benefit from better documentation. With Spruce Visits, your patient can revisit your treatment plan and recommendations as many times as they need to remember your advice. We know that patients do not retain much of what we say during regular visits, so we give them after-visit summaries and handouts, but these are typically boilerplate, and there isn’t time both to say things out loud and also to type them out. On Spruce, you can communicate your plan once and have it serve both functions, preventing unnecessary calls to your office, emergency department visits, and unintentional non-adherence. Yes, very much so. We’ve spent the last two years working hand-in-hand with a teledermatology physician group, Spruce Physicians, that has been treating patients via Spruce Visits. The members of Spruce Physicians are all board-certified, US-based dermatologists who also practice in person, and they worked closely with us to develop the field-leading set of dermatologic Spruce Visits that they use on the platform. These physicians, who have uncompromising standards of medical quality and professionalism, have treated many thousands of patients on Spruce at this point, and they are extremely satisfied with the process and the clinical results. We’d be happy to put you in touch with them to discuss their experiences and views, if you’re curious. We’ve also had the benefit of two years of patient feedback, both internally and in review systems that we don’t control (e.g., the Apple App Store or Google Play). Through this, we’ve seen that patients are overwhelmingly delighted with the care that they receive via Spruce Visits, and their collective receptiveness to asynchronous telemedicine has convinced us that this is the way forward. Give it a try with your own patients on Spruce; we think you’ll agree!